This class is for beginning calligraphy artists. If you have done calligraphy years ago, this is a great refresher course to jump back into it! 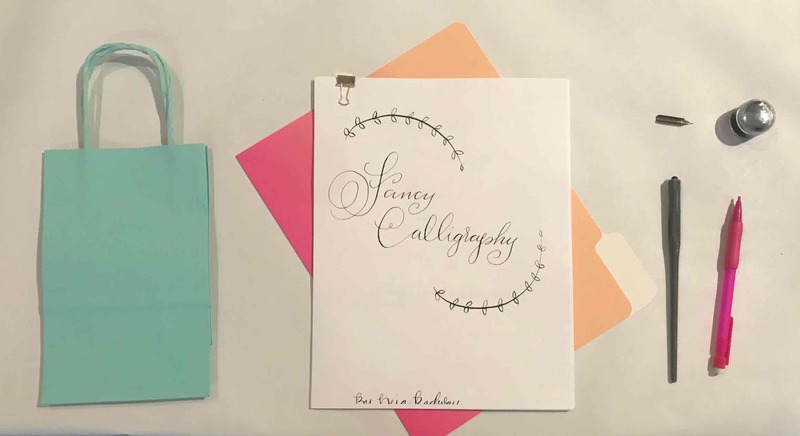 Fancy Calligraphy is a 2.5 hour long workshop with a modern spin on calligraphy. The class will teach you how to set up your calligraphy pen, how to hold it, how to dip into ink properly, and learn to write the alphabet. You will have step by step instruction from Deja.You will also learn to write words and phrases too. There will be plenty of time to practice and one-on-one instruction. This is an excellent class for learning the art of Fancy Calligraphy or just to learn how to improve your current calligraphy writing skills. All supplies will be included with this class. You will leave with a take home kit so you can keep practicing at home! Deja is a cake designer and a full time mommy! She runs a cake business called Fancy Cakes! She has such a talent with making wedding cakes that she started to also make wedding signs with her calligraphy writing! Deja loves to teach, she also teaches Fancy Flower Making at the studio. Some may know her by her mama... Dumpster Diva! Yes, she is just as much fun as Melissa!